I got word this morning about the recent closure of Christina’s on Orcas Island — the first fine-dining restaurant to knock my socks off after I moved to Seattle in 1988. I remember that dinner well: Only days after I arrived, my best friend — who’d lived here for years — dragged me off to Orcas and to Christina’s, to show me why I’ll never want to leave this corner of the country. How right she was. 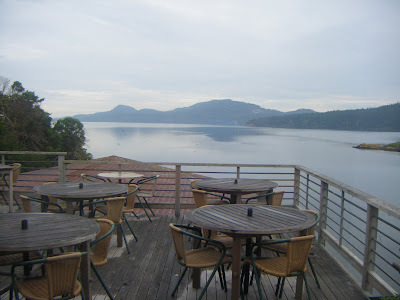 I can still recall the fresh, locally procured food (cooked by the restaurant’s namesake chef, Christina Orchid), the corner table we sat at, the service (courtesy of Christina’s husband, Bruce, who tended our table) and the view — which was, and remains, glorious, rain or shine. The view from the deck at Christina’s. In the many years since, Christina’s became my family’s go-to restaurant when we vacation on Orcas, and we were sad to see it change hands in 2008. So sad, in fact, that after eating there under its new management, we never went back. Clearly we weren’t alone, as the restaurant’s current-owner Maureen Mullen explained to a reporter from Islands Sounder, the local paper that chronicled the closure. “Personally, I’m walking away,” Mullen said of her decision to shutter the restaurant. By doing so, the second-story aerie reverted to the Orchids, who continue to keep busy in their “semi”-retirement and own part of the landmark Porter Building that houses Christina’s in downtown Eastsound. 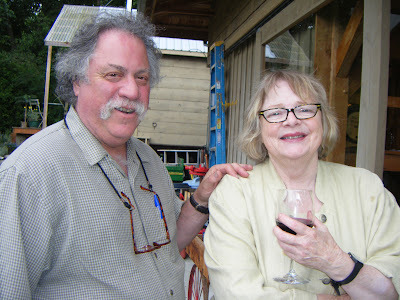 Bruce and Christina Orchid, enjoying semi-retirement at their farmhouse on Orcas Island.